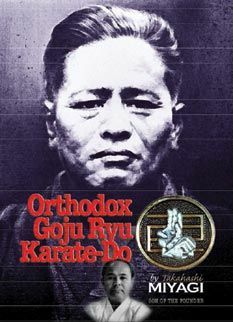 Book Orthodox Goju Ryu Karate-Do, Takahashi MIYAGI, son of the founder, english, 220 pages, 15 x 23 cm, Special limited Collector's Edition (1000 copies worldwide), certificate of authenticity, lamiated dust jacket, gold foil embossing, over 500 photos and over 75 drawings. History of Karate Do - What is Karate Do - Behaviour and Attitude for beginners - All the basic techniques of Goju Ryu - Warm Up Exercises specific for Goju Ryu - Body Building and training with equipment including makiwara - Kata including Sanchin, Tensho, Sai Fa, Sei In Chin, Shi Sho Chin, Geki Sai Itch and Ni plus loads more about the kata - 3 Types of Kumite plus combinations. This ultra rare book on Goju has never before been in print in the English language. Translated by long time karate-ka Nobu Kazi, this fabulous book is filled with hundreds of photos and line drawings. Originally published over 40 years ago in Japanese only this is one book that no one can argue with as far as blood lines go as this was written by Miyagi Chojun's son Takashi Miyagi the only son of the master to pursue his fathers teachings and continue in the propogation where his father left off.